Compare the two trees below. In both cases the goal is to have an application with two independent modules (frontend and reporting), and one shared/common module (domain). The code in frontend shouldn’t be able to access code in reporting, and vice versa. Both modules can use the domain code. Ideally, we would like to check these access rules at build-time. 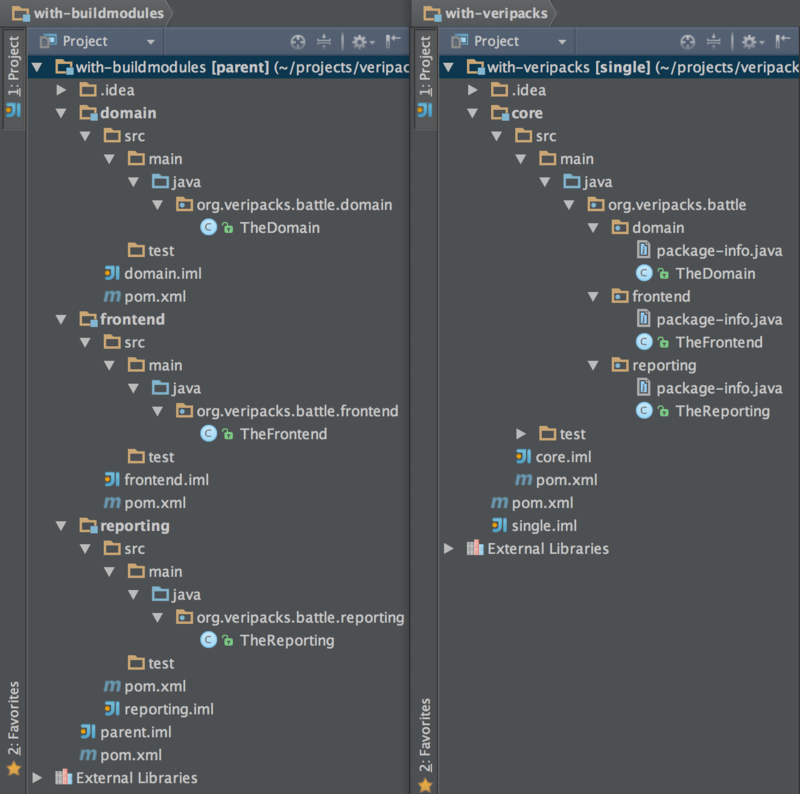 On the right, on the other hand, we have a much simpler structure with only one build module. Each application module now corresponds to one top-level project package (see also this blog on package naming conventions). Now, isn’t the Veripacks approach simpler? :) There is still build-time checking, which is possible by running a simple test (see the README for details). Plus, you can also use other Veripacks features, like @Export annotations, which is a generalized version of package-private scope, taking into account package hierarchies. 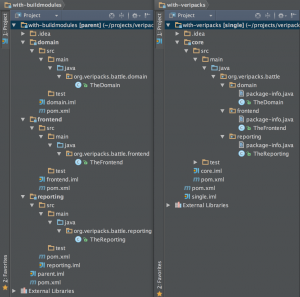 There are also other benefits, like trivial sharing of test code (which is kind of hard with Maven), or much easier refactoring (introducing a new application module is a matter of adding a top-level package). The immediate question that arises is – what about 3rd party libraries? Most probably, we’d like frontend-specific libraries to be accessible only in the frontend module, and reporting-specific ones in the reporting module. Well, not supported yet, but good news – that will be the scope of the next Veripacks release :). You can view the example projects on GitHub.